This is so thoughtful and adorable. I love it, Laura! Thanks for sharing!!! Thanks for the comment Mel! Happy to share-- thanks for the kind words, Emma! What was your secret ingredient? The Iron Chef idea is brilliant. Thanks Deli, I hope so too! I've been looking for a practical, affordable, organized, flexible date night plan for me and my husband. Our anniversary is Dec 7th. This will be the perfect gift. Thank you! This is fantastic, but....Why do they need oversized pencils for a picnic? Everything else makes perfect sense, but I can't figure that one out. I just added a document that I left out the first go around. You can find it under the picnic section titled "Cloud Sketches Sheet." This is what they used the oversized pencils for but normal pens or pencils would work just as well. Thanks for catching that! Your post is really fantastic! Big thanks for share it with us! Hugs! Just to be clear, the pages in the binder are each month ideas printed? Right. I used 12 binder tabs; one for each date. Some tabs held just the first page (like month 6) but most had several other sheets as well (month 1 for example had three sheets). All of the non- paper goods, like candy or glowsticks, were wrapped up and labeled. I crammed the binder and all the wrapped pieces into the box and sent it off! Between the tabs I put all of the documents for that date. For the first month (the picnic date), for example, I have three documents: the "front page" which explains what that date is, the cloud sketches sheet and the list of parks in that city. All three of those documents are attached above via google drive. I hope that helps! I am going to create a twist to this one. I am going to put a box together for our first year of marriage and give it to him as a wedding gift from me. He works a lot so this will help us make time and keep things from becoming monotonous. :) I cannot wait to document our first year together. This is fantastic! Especially since I was grasping for wedding gift ideas for my friend that were "off the registry." 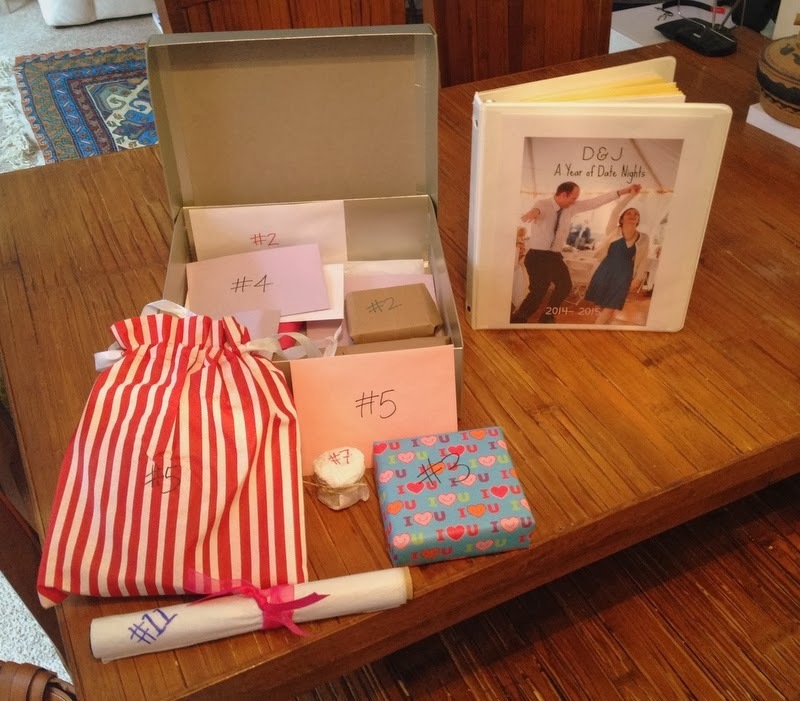 Can you clarify one thing: is the binder included with the box of gifts or was that for your own purposes in planning out the dates? Thanks a bunch!! Can't wait to start putting this together! Thanks Nikita! I included the binder in the box - I layered all the wrapped gifts and then put the binder on top. It included the description of each date in addition to any supplemental materials (ie the mall scavenger hunt checklist). I want to link your blog with my new post about how I changed a few things. Let me know! You can contact me on my blog! Thanks! Hi Laura... I love this idea. I have 2 kids getting married soon and was thinking of making this for each of them. Do you let them know what the date is going to be before they choose it? I was thinking of putting construction paper over the description of the dates so that they would be surprised when they pick each number. They would see the tabs, but when they go to that tab they wouldn't be able to peek ahead of time. I love this idea! My boyfriend owns his own company and after dealing with all the stress and working nearly every day of the week he is very much stay a in and do nothing kind of person so often "date nights" involve getting some sort of take-out food and watching movies. I love this idea as a way to get him out of the house once a month & a great way to have something planned so there is never any pressure on us last minute when we're ready to go out! my husband and I have been through a lot... grieving the loss of our youngest daughter and struggling in our relationship. She had severe medical issues and we were her nurses- long story short- I think these simple dates well help us learn to enjoy each others company again. I am excited to get the things together and start soon :) Thanks for putting everything together and allowing us to print off. I know one day I could create different dates as well but this is a great start! and great gift idea. Thank you so much! I've been driving myself crazy trying to find a gift. This is so cool! I think my husband and I will make one for us this year! we already have a date night jar. But I like the idea of unwrapping the stuff! OMG, this is a post from 2014 and it found me in my darkest hour - thank you, I almost lost my hope on finding anything personal for my closest friend for her wedding and here it is <3 perfection! Making this for a wedding gift for my coworker who loves thoughtful, fun gifts! This is such an awesome post, I'm so appreciative of your hard work for this! I hope it keeps making the rounds because i know you'll have made a ton of people so happy with this awesome idea! Thank you! Hi, I love this idea! Although your picnic template isn't working cause apparently its violating regulations. What did the template consist of? I am also getting the error for the picnic template. Does anyone have one that they could share? I'm also after the picnic template...any luck??? Also did u use 2 of the same puzzles or different? also what secret ingredients did u use? 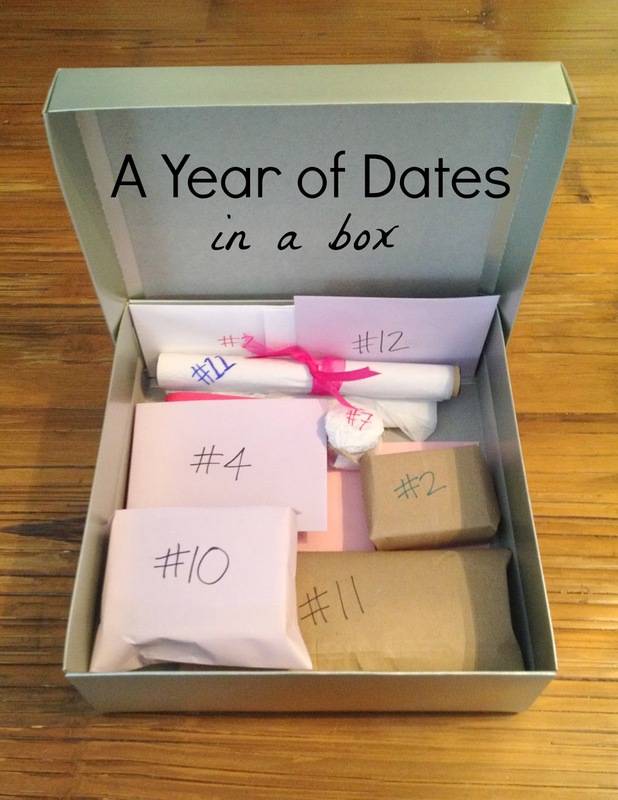 I love this article, ideas are awesome and I liked A Year of Dates (in a box) ideas very much, thanks for posting such a creative ideas. You can visit https://www.giftcart.com/buy-online-gifts-for-anniversary.html for some more ideas about anniversary gifts. I love this idea!! It's exactly what I'm looking for. Could you possibly change the permissions for the templates so that they can be viewed and used for this awesome idea? Thanks so much! Really love the whole idea and the details! I only have some troubles opening the document 'picnic'. This is what I get opening it: We're sorry. You can't access this item because it is in violation of our Terms of Service. No idea how to solve this. Have no troubles opening the other files.. I love this idea and want to try it this year. I am able to access all linked files except the 'Template (Picnic)' file. Will you please share it with me? I'd like to know how you planned out this date night activity. Thank you! Can you share the picnic template? !